We conclude our look at pre-Comdex builds with photos published in February 1984 issue of a French computer magazine called Golden. The photos were part of an interview with CEO of Microsoft France and they reveal several interesting details. The article (which can be viewed here) is in French of course, and since I don't speak French, I can't really make use of the information within it. If anyone understands what it says and is willing to translate it for those of us who don't, please let me know. The magazine published two photos, but unfortunately they are of rather poor quality, which makes it harder to discern certain details. One photo is part of the interview itself, while the other acompanies a special section about Windows. 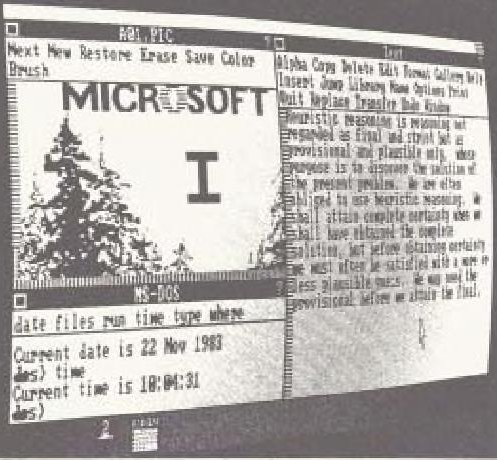 Starting with the one in the interview, we see three open windows: Art showing the standard A01.PIC demo image, Text showing standard demo text and an MS-DOS window. There's also at least two minimized applications, one being another instance of Art with what looks like the digit 2 in the icon (perhaps this means A02.PIC is opened in that window?) and the other being Calendar. 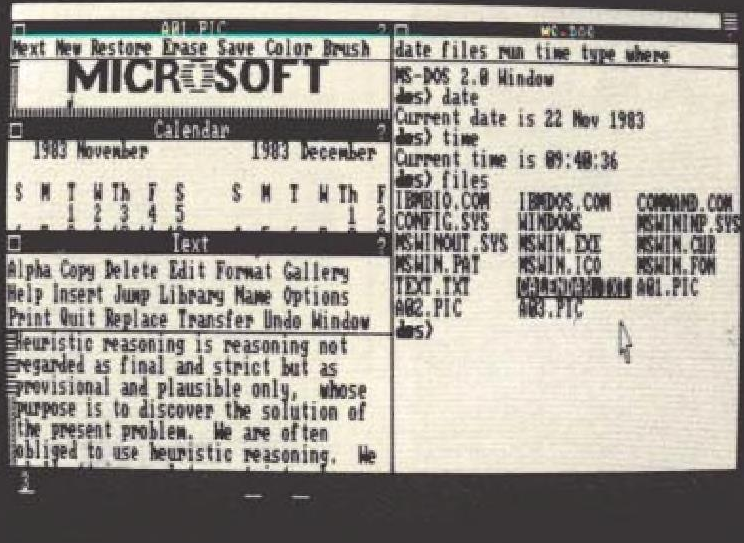 The contents of the MS-DOS window reveal that the system date is set to 22nd November, 1984. The menu bar is the same as in the InfoWorld build, though it does seem to be a bit narrower in terms of height. If you look closely, the descenders of letters y and p in "type" appear to be touching the bottom border of the menu bar, which wasn't the case in previous builds. The standard "dos>" input prompt is now displayed in bold. Text and Art reveal nothing of importance, aside from the fact that the question mark in the help button now sits slightly lower and is vertically aligned with the left hand button. Text and MS-DOS window have swapped places, and Calendar was restored into windowed form. Now there's at least three icons in the icon area and the left one may or may not feature the digit 1. They could all be minimized instances of Art application, but it's hard to tell due to really poor resolution of the image. Due to the system time displayed in the MS-DOS window, we can tell the second photo was actually taken first. The "files" command was ran after that. This time it lists different files than what we've seen in previous photos. Please note that we don't know where these files are located, since no one ran the "where" command. They could be on a floppy drive or even a hard drive. IBMBIO.COM, IBMDOS.COM, COMMAND.COM, CONFIG.SYS: these are standard DOS system files, probably version 2.0. WINDOWS: considering there's no file extension here, I guess this is a folder (supported from DOS 2.0 onwards). MSWININP.SYS, MSWINOUT.SYS: I have no idea what these are, though based on the .SYS extension they could perhaps be early Windows drivers (Microsoft Windows input/output)? TEXT.TXT: obviously a plain-text file, perhaps it's the heuristic reasoning demo text we've seen so often by now? As far as Calendar goes, the only notable difference is the apparent lack of empty space above the window content, as it now appears to be touching the menu bar. This is clearly another different build and it contains several details which we'll continue to see in the future. This means it's chronologically newer than both the announcement build and the unknown early build seen in the InfoWorld issue. Next time, I'll finally talk about the build which was demoed at Fall Comex 1983 on 29th November. Because there is quite a lot of material to go over, I may have to split it into several posts.